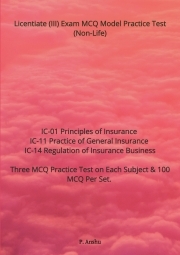 Description of "Licentiate (III) Exam MCQ Model Practice Test (Non-Life)"
Licentiate (III) Exam MCQ Model Practice Test (Non-Life) This is developed according to latest syllabus outlined by Insurance Institute of India. Student can practice 7 days prior to their exam to evaluate their exam readiness. The questions were developed synchronised with latest exam pattern questions. Anshu, a Certified Financial Planner, a passionate Six-Sigma Certified corporate trainer, driven by an objective to achieve & empower financial inclusion through quality education with a fundamental principle of “Earn living hood by serving”. Equipped with over half a decades of national & international financial industry experience specialized in area of operation, training & Content development. Numerous contributions have been made by him in the field being associated with world renowned organization, NGOs, Educational Institute & Consultants. Also serving as visiting Faculty to various financial academic institution & Hon Global Advisor: American Academy of Financial Management® Presidential Board, AAFM® Board of Standards. Reviews of "Licentiate (III) Exam MCQ Model Practice Test (Non-Life)"